Folklore has it that the bandit Janosik robbed from the rich and gave to the poor on the Slovakian and Polish side of the Tatra Mountains. "Janosik" is a classic 1970s Polish television program, set in the 18th century. The 13-episode series is filled with action, adventure, and romance. There is an array of colorful costumes, fancy hats, and sword fights. Moreover, there is also an element of humor. 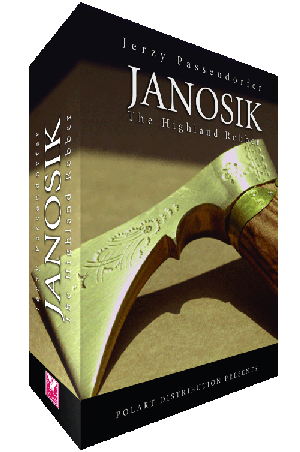 Janosik transforms from an innocent sheepherder to chieftain of the bandits, seeking truth and justice. At this time in history, this area of Poland was controlled by the Austrians. The local Count abuses the villagers to his advantage and the Austrian army conscripts many of the young men. The villagers see Janosik as their savior, as he comes to their rescue from time to time. Janosik coming to the aide of the people only enrages the Count and the Austrian army. Ultimately, the vengeful Austrian army and the Count will put all their attention on the capture of Janosik. In the process of coming to the rescue of the poor villagers, saving his friends from hanging, and kidnapping the Duke's niece with the intention of ransoming her, he falls in love with the beautiful, strong, young village woman Maryna. The romance between Janosik and Maryna builds with time. The episodes build off each other, and running jokes among the characters emerge. One such joke is the Count's assistant always scheming plans to foil Janosik; yet, they never do and it frustrates the Count. Furthermore, the two brother-in-laws in Janosik's band always argue over the ownership of some land they both claim to own. "Janosik" is a well liked and highly watched program in Poland, despite its age. It is worth watching this classic Polish television series of the historical exploits of a folk hero.